Three-hundred and twenty million years ago, amphibians were the dominant life form and reached sizes of up to twenty feet long. Through time, and as new animals rose, such as the dinosaurs and then mammals, amphibians became smaller and stayed in the aquatic environment or moved underground as they became the small, elusive creatures that we know today. Now, after hundreds of millions of years on this planet, amphibians are facing rapid declines. Amphibians are constantly threatened by environmental stressors such as water pollution and the spread of fungal diseases. 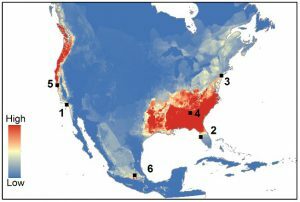 You may know that amphibian populations have been experiencing declines globally and that one contributor to that decline has been the nearly ubiquitous presence of the fungal pathogen Batrachochytridium dendrobatidis, or Bd for short. This pathogen causes chytridiomycosis (chytrid for short), which attacks the skin of amphibians. Amphibians are unique because of their ability to breathe through their skin; therefore, if the skin of an amphibian becomes infected with chytrid then the outlook is grim. Scientists are still working hard to research this disease to figure out how we may be able to combat global amphibian declines, but unfortunately, we now have another pathogen to worry about. the importation of 201 amphibian species that may be carriers of bsal. This is a huge step toward making sure that bsal does not make its way into our beautifully diverse amphibian communities. However, our job is not done yet. 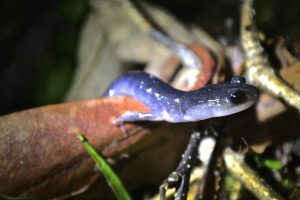 Wild South is involved in research monitoring amphibian populations for the presence of bsal so that if it is detected, we can take action quickly, but we need your help to make sure that bsal stays out of the U.S. If you see amphibians in a pet store, talk to the manager of the store, inform them about the threat of bsal and ask them to stop selling amphibians as pets. Donate to Wild South so that we can continue and expand our efforts to monitor for bsal in the South.